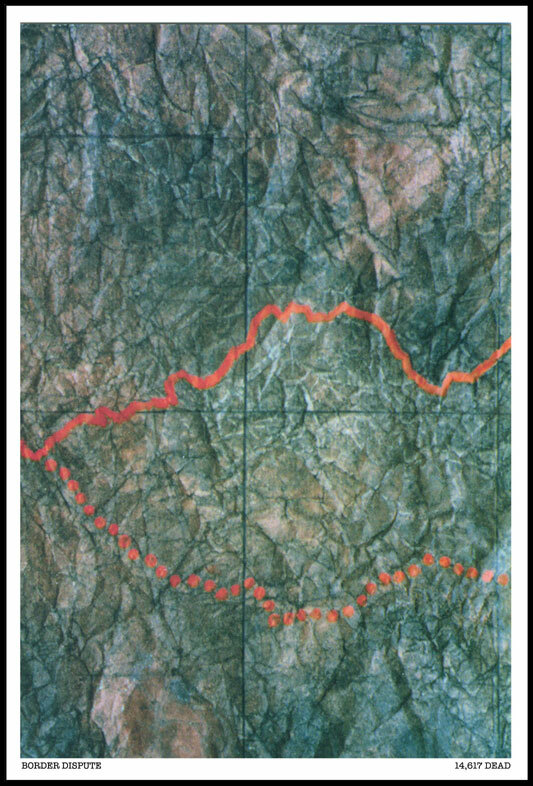 The 'Maps' grew out of my years of engagement as an artist with the land: how we think of it, see it, use it. Arriving at 'mapping' provided me with a fresh arena in which to paint (composition, colour, matter) and at the same time explore beliefs, fears, hopes, politics. 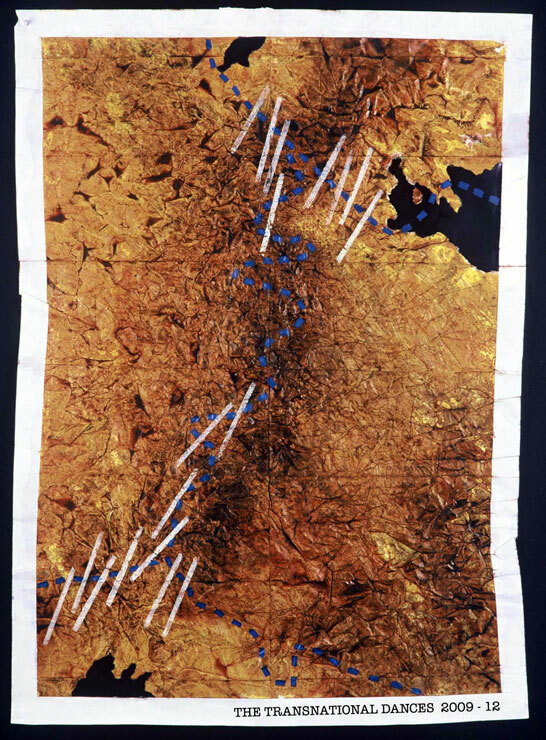 In each piece I intend to draw the onlooker in by means of its surface qualities, readable as land-forms seen from above; then to communicate an idea with text and/or the map-maker's language of dotted lines, cross-hatched areas etc. So I'm drawn to issues, past, future or present, like 'The Myth of the Wall' (Israel/Palestine; U.S./Mexico; Baghdad; Berlin; Belfast; London), or Colonialism ('Lines Drawn in European Capitals'), or U.S. foreign policy (Iraq, Afghanistan, Darfur, water-wars), or Global Warming. The actual 'Maps' are all about 120 by 80 cm. Medium: oil on paper. This Map came about as a result of a visit to the British Library's exhibition of maps (Lie of the Land), including a German wartime map of Slovakia, each town with beautifully hand-painted pie charts of ethnicity, different colours for Jew, Gipsy etc. And then reading about the local maps posted on street corners by the Israeli authorities, announcing Palestinian land to be taken, carefully and accurately coloured in red, and Palestinian houses to be taken, coloured in blue. 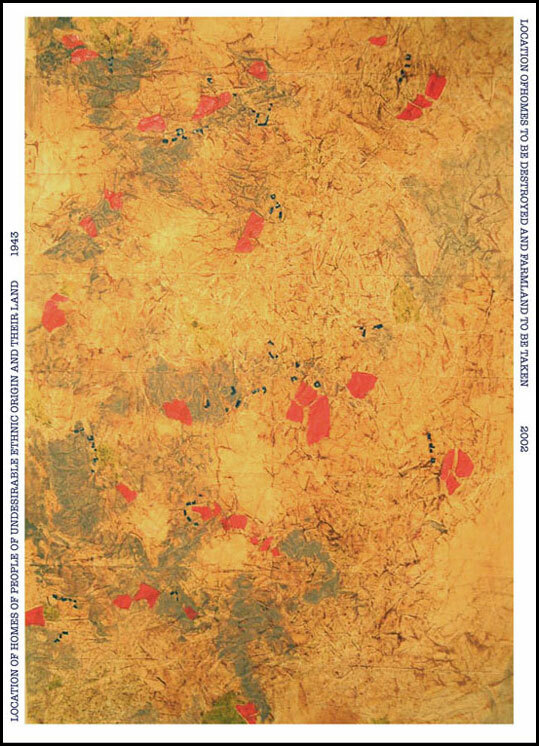 The parallels between the (mis)use of maps seemed unavoidable, even down to the care taken in their making, presumably by artists. Or you can send a cheque to Just Press, P.O. Box 59, Manchester M40 4AY, with a clear return address and you will receive the item within 28 days. In common with several of the 'Maps', this is entirely notional in that it does not refer to a specific conflict, but is one bleak way of pointing up the futility of war, where lives are lost, infrastructure destroyed, hatred lasting a generation, and a border changes slightly or a small amount of territory 'changes hands'. 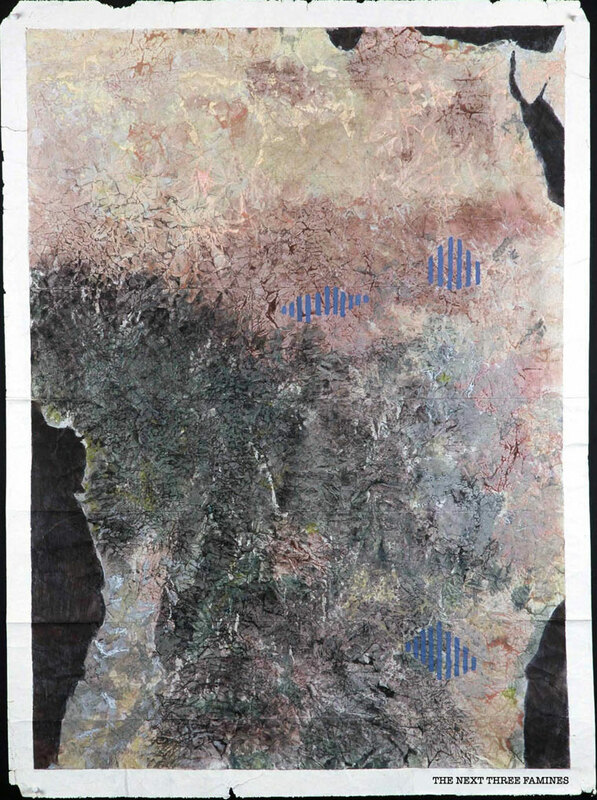 This is one of several 'Prayer Flag' maps, here where a desirable alternative to war is imagined. Here the title is deliberately off-hand, pointing up the dreadful inevitability of such events at some time in the future, and the inadequate way we tend to know of them through the media, where they are often 'news' for one day only.